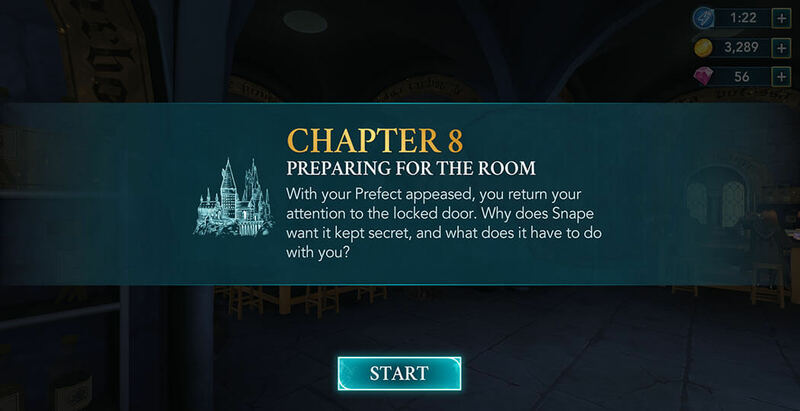 Hello everyone, are you excited for Chapter Eight of our Magical Journey Walkthrough for Harry Potter: Hogwarts Mystery? In the previous Chapter, we helped Ben Copper overcome his fear of flying. We also earned back some of the House Points we lost, and we did so by helping Merula nonetheless! But the mystery of the forbidden upstairs corridor remains, and in order to solve it, we’ll need the help of some of our friends. Also, since the door is sealed with an impenetrable lock, opening it would require some magical help, some nice spell that could do the trick and unlock it. Something like the Unlocking Charm – Alohomora. 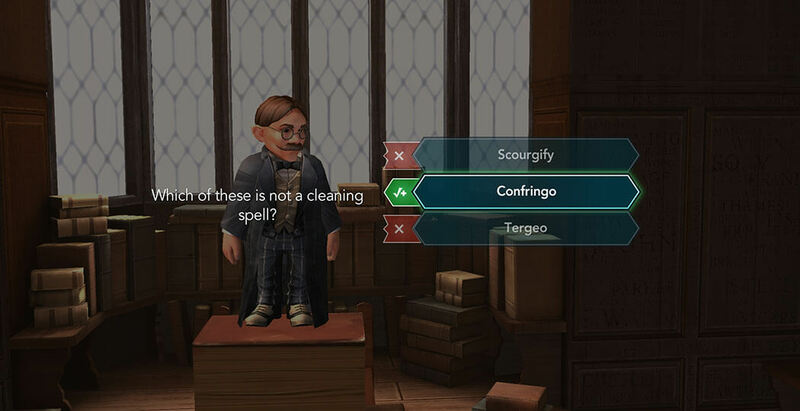 Luckily, that is exactly the lesson Professor Flitwick is going to teach you. 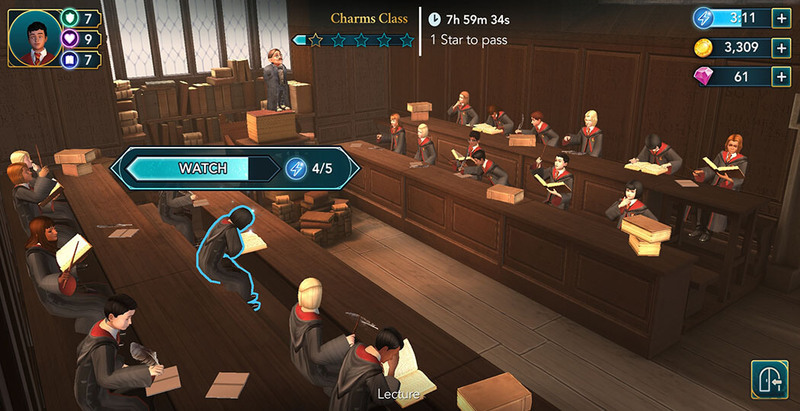 So, tap on the GO button and proceed to the Charms Classroom. 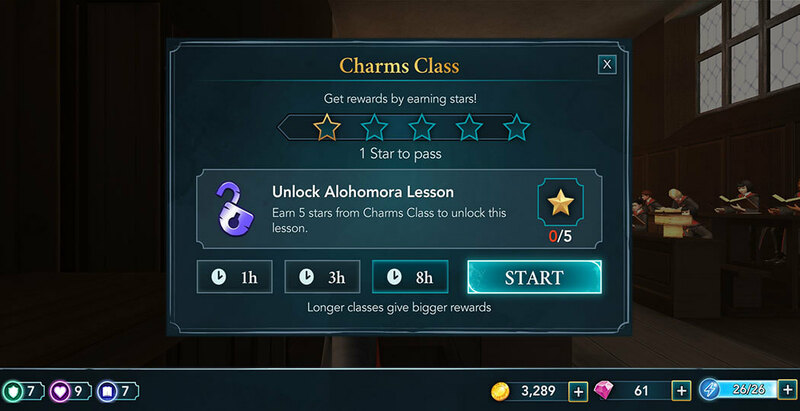 To “unlock” this lesson you’ll need to earn a total of five stars from Charms class. The best course of action would be to take an eight-hour lesson. When you’re ready, hit the Start button to begin. Like before, try to optimize energy usage and do your best to succeed at mini tasks in order to get some additional Empathy points. When you are done, the lesson for Alohomora will be “unlocked”. Tap on the GO button and proceed to the class. Once you’re there, you can check what some of the other students have to say by tapping on their speech bubbles. Afterward, Professor Flitwick will hold a quick explanation for today’s lesson. This one will require you to earn five stars within three hours. It is recommended to have full energy before starting it. Like before, pay attention to the Star Meter and try not to waste energy. Also, doing all the mini-tasks will give you fifty Empathy points (ten for each of them). Lastly, when you obtain the fifth star, it’s time to cast the Unlocking Charm. Trace the path on the screen to successfully cast Alohomora. Congratulations! You just learned one of the key components for accessing the Mysterious Room in the forbidden corridor. The next part is to devise a plan with your faithful friend. 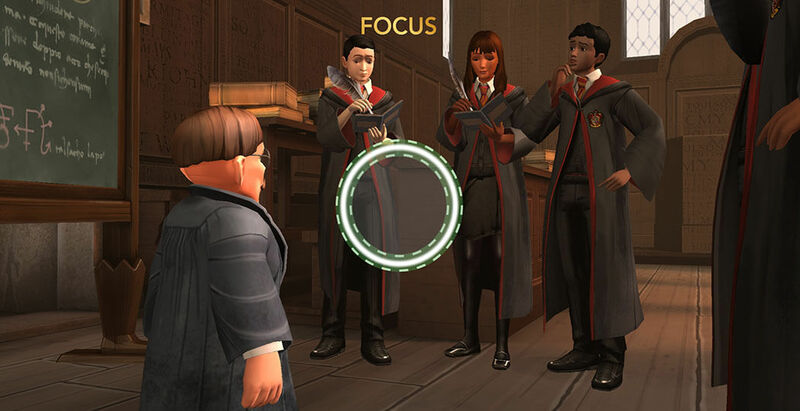 Tap on the GO button and proceed to the Great Hall to talk to Rowan. Once you’re there, he’ll greet you with a huge smile, happy that you managed to earn back some House Points. You’ll have a conversation with him about all the things you need to prepare before venturing to the upstairs corridor. Then you’ll have to decide who else you want to bring along. 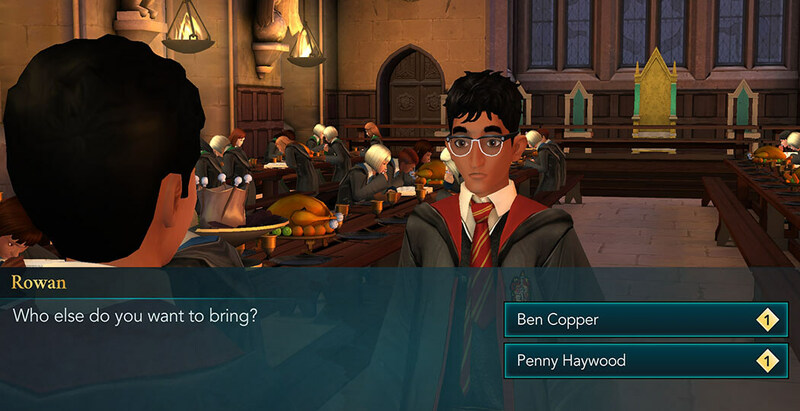 You have two options – Ben or Penny. As for the story aspect, there is not much of a difference no matter who you decide to bring, but keep in mind that you’ll be able to raise the friendship level with the one you bring along. Afterward, you’ll learn that your Prefect requested to see you. 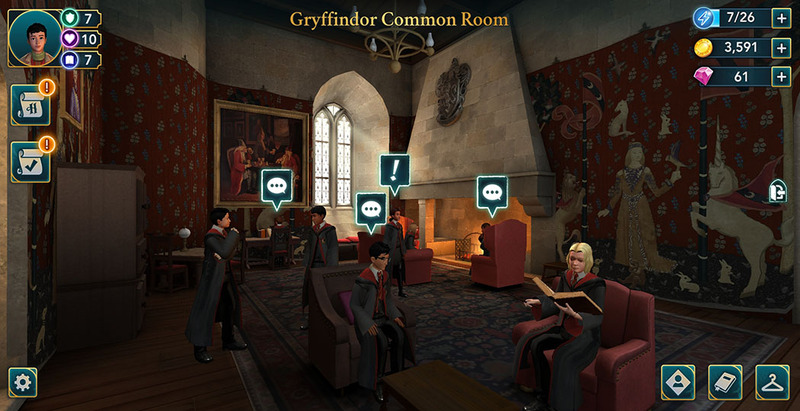 Tap on the GO button and proceed to your Common Room. You can check what some of the students have to say by tapping on their speech bubbles. 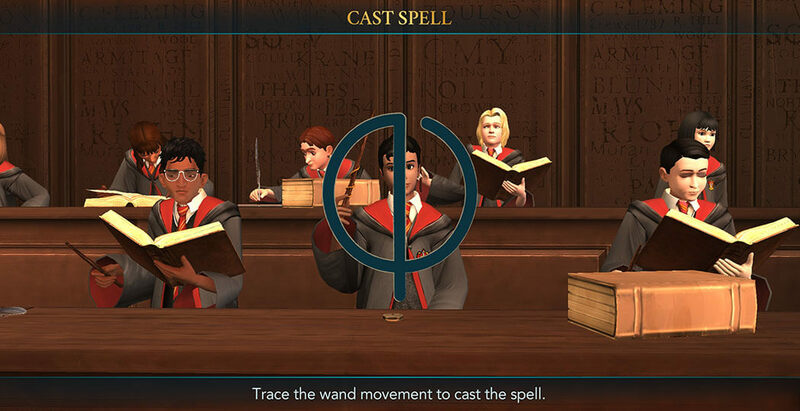 You’ll learn that your Prefect wants to help you improve your dueling skills. She arranged for you to practice with Ben. So, for the next task, proceed to the Training Grounds. The two of them will wait for you there. 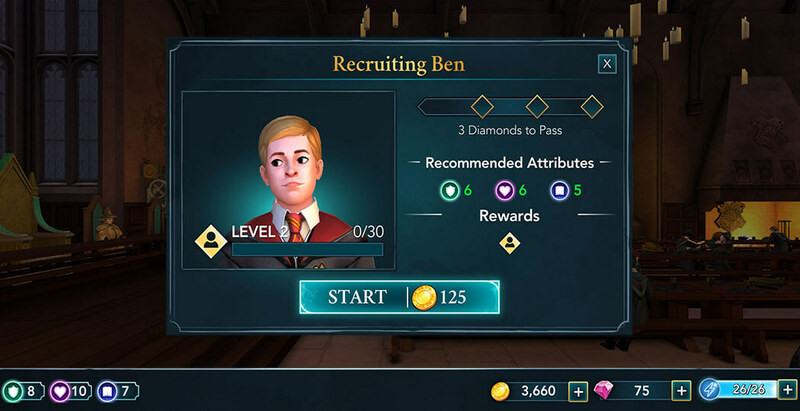 After a bit of talking, you’ll have to choose if you want to give it your all against Ben, or if you want to go easy on him. The first option is generally better since it will reward you with ten Knowledge Points. Tap on the crossed wands icon to continue. The window will show you the recommended attribute levels for this duel. Hit the Start button to begin. Since Ben has a cowardly personality, most of the time he will go with the Defensive Stance. Take advantage of this and go with the Sneaky stance to beat him. The best action for the duel would be a Flipendo charm since it deals a lot of damage. Do this a couple of times and you will win the duel. However, if it happens that you lose for some reason, do not worry, you’ll be able to try again. The only downside is that you’ll have to pay one hundred gold coins each time you start the duel. Your Prefect will be very satisfied with your performance. She’ll let you know that she’ll be your opponent in the next duel. So, you have to get prepared for that. 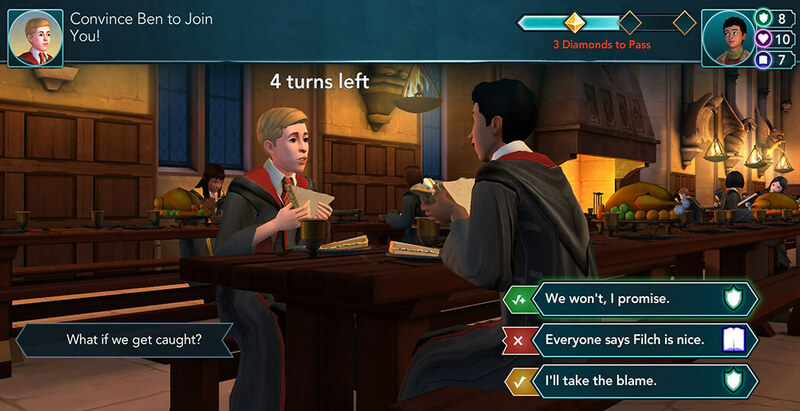 Luckily, Rowan should be able to help you with his vast knowledge, and together you might find a good strategy to win. For the next task, proceed to the Great Hall. You’ll see that several of the students have speech bubbles above them, so be sure to check them out. When you’re done with that, tap on the exclamation mark above Rowan. He’ll ask how you feel about the upcoming duel. You have three options to respond with. No matter what answer you choose, the outcome is the same, but each of those will give you five points in a different attribute. Rowan will tell you that he gathered a lot of books related to dueling, so hopefully, some of it could prove useful. To complete this task, you need to earn five stars within three hours. However, only one star is required to pass, so it shouldn’t be difficult to accomplish. Hit the Start button to begin once you’re ready. Simply complete the actions to fill up the Star Meter. 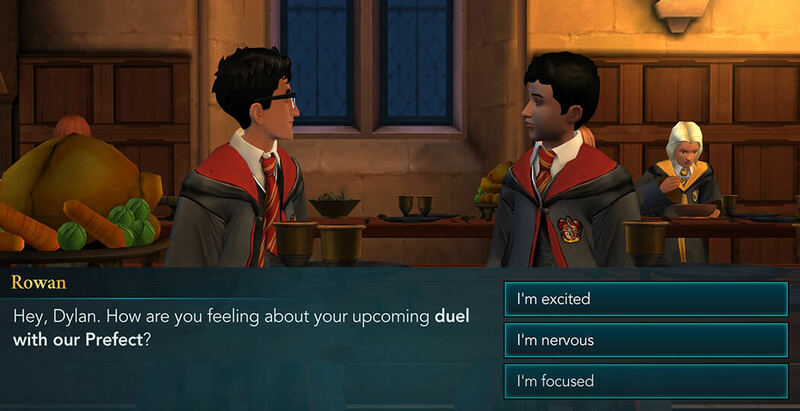 After you’re done, the next task will be to duel against your Prefect. There is, however, a one-hour waiting time, so if you are impatient you can spend some gems to speed it up. In any case, proceed to the Training grounds once you are ready. 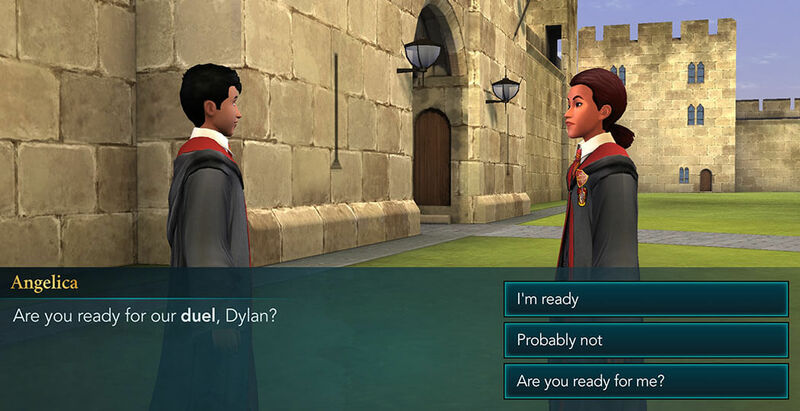 Your Prefect will ask if you are prepared for the duel. You have three options to answer with. Each of these is going to give you five points in a different attribute, but the outcome is the same, so pick whichever one suits your character’s personality the most. After that, tap on the crossed wands icon to open the duel window. It will show you the recommended attribute levels and also the gold cost of it. 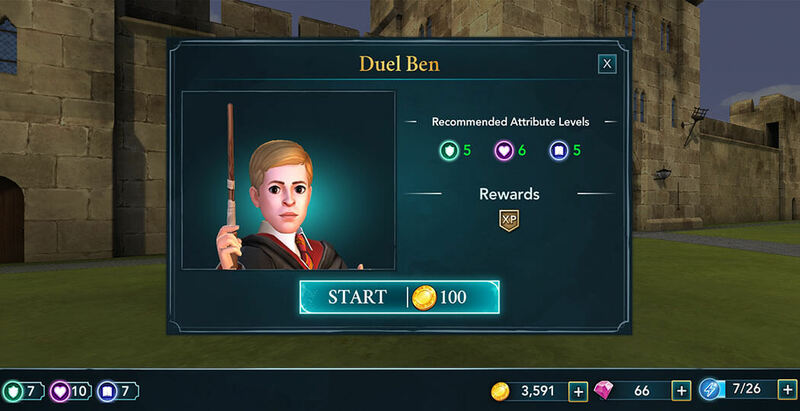 Sadly, compared to Ben or Merula, your Prefect is a lot more unpredictable, so this will probably be the hardest opponent you’ve faced so far. However, you should have a substantial attribute level advantage, so all things considered you should have an edge in this duel. Even if you lose, you can try it again until you are victorious. When you win, she will be impressed by your dueling skill and ask if this could remain a secret between the two of you. You can choose to promise her not to tell anyone, or not. 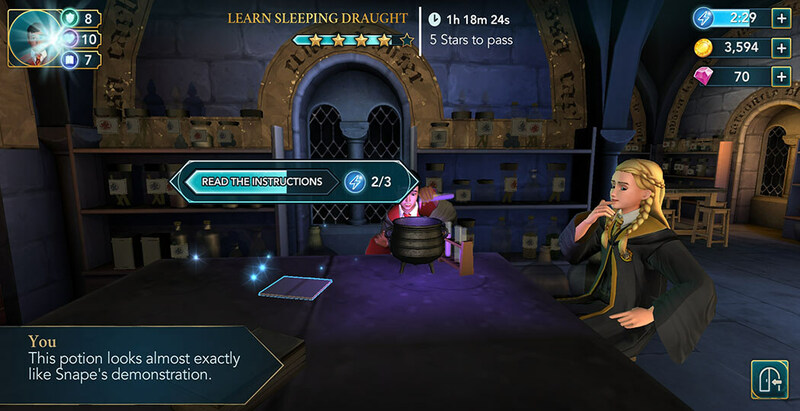 The first option is strongly recommended since it will award you with ten Empathy points, and your Prefect will be very glad about it. 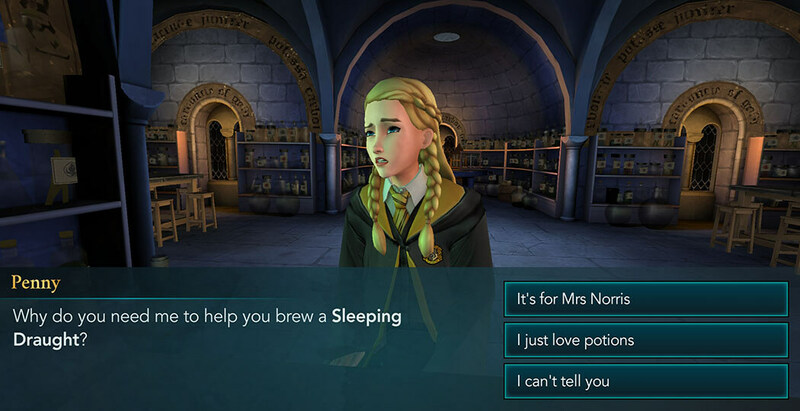 So glad, in fact, that she will promise to recommend you to the Head of your House for the next Prefect. This will also complete the side quest, and you’ll be able to collect some nice rewards for it. Next part of this Chapter is brewing a Sleeping Draught. 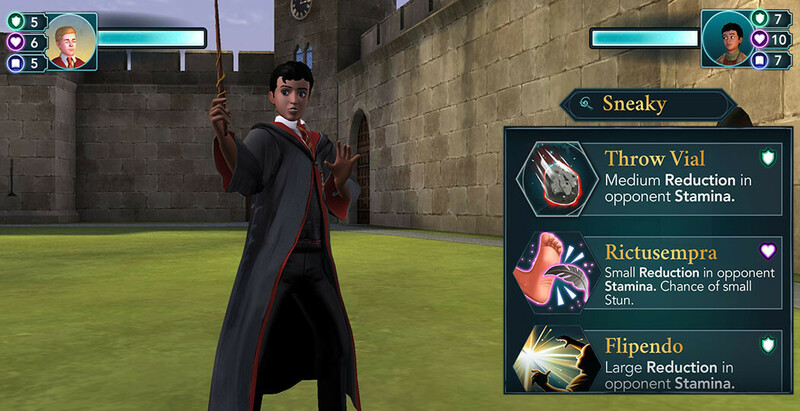 When you are ready, hit the GO button and proceed to the Potions Classroom. You’ll see that Penny is there waiting to help you with this. She is, however, curious as to why you need this potion. You have three options to respond with. Each of these answers will award you with five attribute points. It is recommended to be honest with her, and if you decide to tell her the truth she will be super excited and promise to keep your secret safe. After a bit of talking, tap on the exclamation mark and hit the Start button to begin this task. 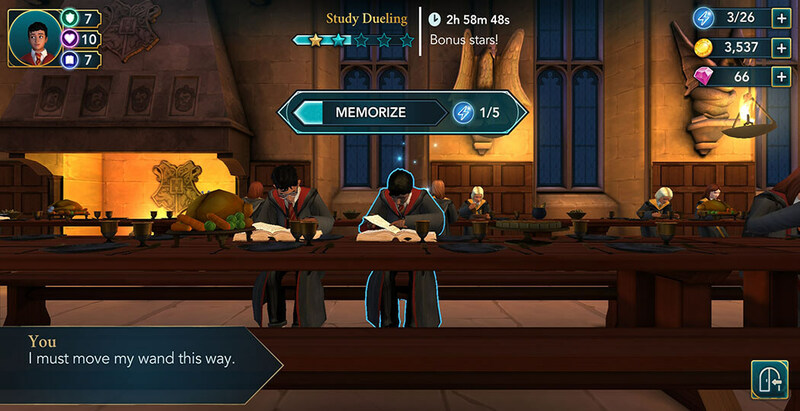 For this, you need to earn five stars within three hours, so it is somewhat recommended to start with full energy since you need to earn all five stars to pass. After completing it, Penny will wish you the best of luck, and then the two of you will part ways. 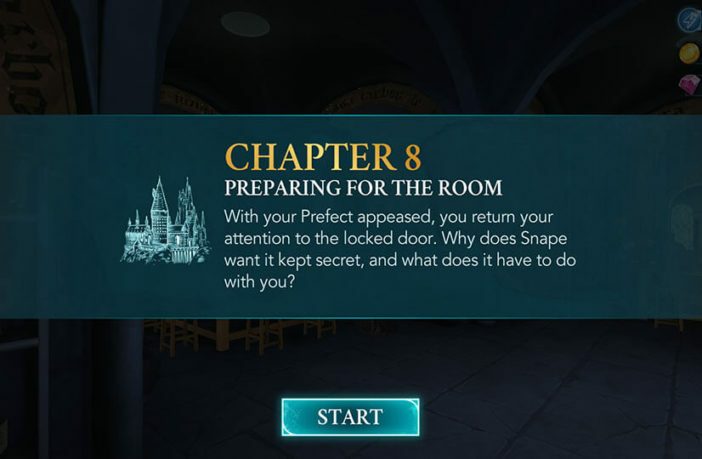 The last part of this Chapter is to convince your friend to accompany you to the forbidden corridor. Hit the GO button and proceed to the Great Hall. 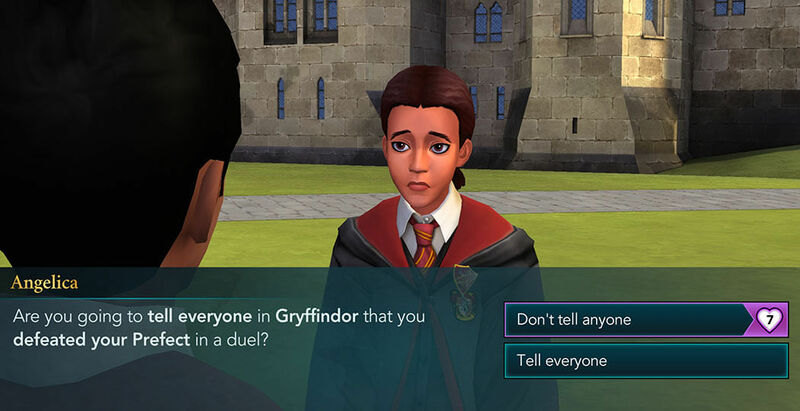 You can interact with other students by tapping on their speech bubbles and checking out what they have to say to you. When you are ready, tap the exclamation mark to start the conversation with the friend you picked for this adventure. 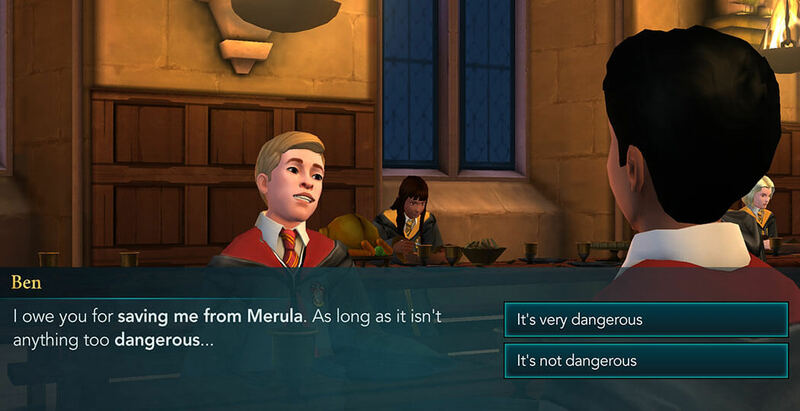 After a bit of talking, your friend will ask if this mission is dangerous, so you can choose if you want to tell the truth or not. Each answer will award five attribute points. No matter what option you go with, your friend will need a bit more convincing. Tap on the handshake icon to continue. The window will display the recommended attribute levels for this task. Once you are ready, hit the Start button to begin. Completing this shouldn’t be too difficult, as long as you are friendly and supportive. You have a limit of six turns to complete it, but realistically, if you pick the right answers, it can be done in three or four. When you are done, the Chapter Eight of Year One will be complete. Now, most of the preparation for the Mysterious Room is done. You are almost ready for your adventure. How did you like this Chapter? What choices did you make? Who did you decide to bring along to the adventure? 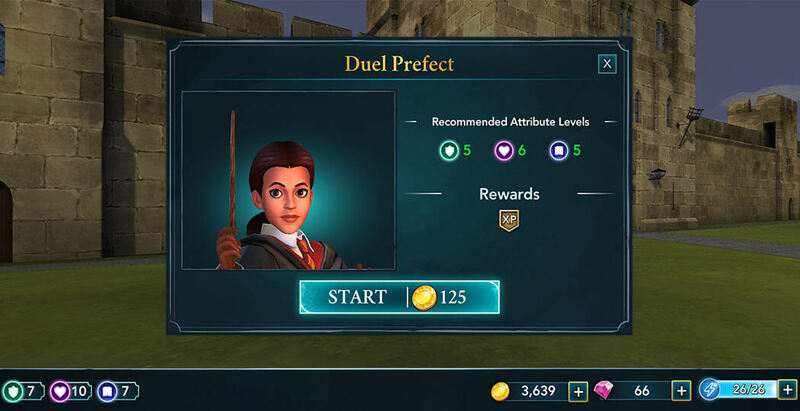 How many tries did it take for you to beat your Prefect in a duel? Let us know in the comments. Thank you for reading. 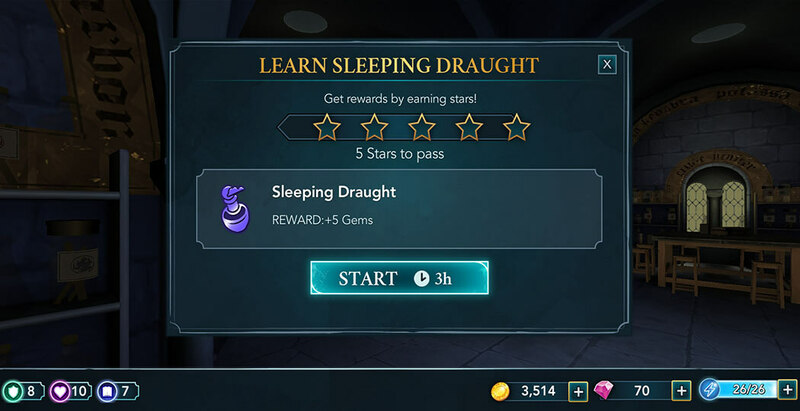 See you soon with another exciting Chapter of our Magical Journey Walkthrough for Harry Potter: Hogwarts Mystery. Until next time!